The Northern Avenue Bridge has existed for over a century, long enjoyed by pedestrians and bicyclists navigating between the South Boston Innovation District and downtown Boston. However, in 2014 the bridge was closed due to deterioration and structural issues. Preservation of the bridge has long been debated, with many believing that it is an important remainder of the Fort Point Channel District's industrial heritage. Several plans for the bridge have been explored in recent years, from restoring it to removing it entirely. 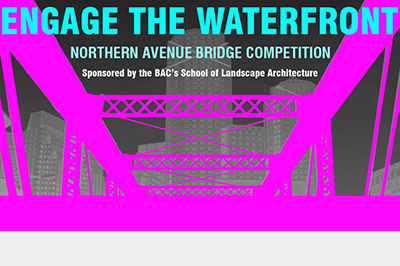 Engage the Waterfront is an interdisciplinary competition with the aim of catalyzing Boston's Fort Point Channel district through re-envisioning the North Avenue Bridge. This competition seeks provocative ideas with a realm of feasibility, with the aim of generating dialogue about ways that this historic structure could evolve and find new life. This competition is a special collaborative opportunity to incite dialogue and process about development being proposed for the Hook Lobster site, along with expansion and inclusion of the two adjacent properties, as well as a determination about the future of the Northern Avenue Bridge. These are all important strategic links between the Downtown Financial District - the emerging South Boston Seaport District - and the Rose Fitzgerald Kennedy Greenway. The Boston Redevelopment Authority is in the process of promoting development guidelines to the State of Massachusetts, focusing on the Wharf District. Ideas generated by this competition will contribute to the forthcoming dialogue and decisions about how best to treat this strategic new development opportunity, as well as Boston's first historic bridge connection between these two vibrant and growing Financial and Seaport Districts. There will also be a site visit and a presentation with Wentworth students. Dates for these two events are forthcoming and will be announced soon. The jury will be a panel of design professionals, faculty, and community partners connected with the bridge's history and development. The final product of each team will be two 24" x 36" boards submitted physically and electronically. Boards should show the team's analysis and final design. Competition teams must declare their intent to participate in the competition by sending an email to aidan.ackerman@the-bac.edu with a full list of team members, including each team member's degree program. The deadline to enter is Friday, March 11th. There will be an information session and a site visit on this day. *For more information, visit the competition website or contact Aidan Ackerman.